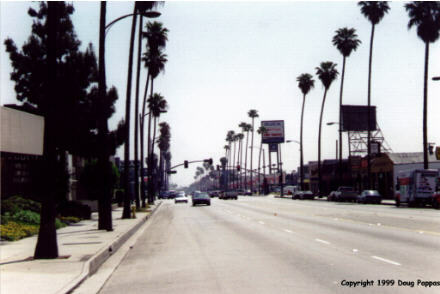 The final seventy miles of Route 66, from San Bernardino west to Santa Monica down the entire length of metropolitan Los Angeles, took about 4-1/2 hours. Not fun. Friday's first stop was the Wigwam Village on the western edge of San Bernardino. This classic roadside structure -- two dozen detached concrete wigwams serving as motel rooms -- used to attrach customers with the slogan "Do It In a Tepee," is now closed, but remains intact. The way strip shopping malls are going up nearby, someone had better rescue it soon. Later on in Monrovia came an equally bizarre sight: McDiner, a McDonald's built long and low, with decorative glass, to resemble a diner. 66 passes through the older, northern suburbs of Los Angeles -- Claremont, Fontana, Azusa, Pasadena -- and then the city itself, including Beverly Hills and Century City, on its way to Santa Monica. The appropriate symbolic end of 66 is Ocean Avenue in Santa Monica, overlooking the Pacific and a classic amusement pier -- but in fact 66 turned south a few blocks from the ocean. The actual western end, the junction of Lincoln and Olympic Boulevards, features a prominent freeway on-ramp. After a brief pause I took that ramp, anxious to leave LA as soon as possible. Easier said than done. Even at 1:15 on a Friday afternoon, the traffic was backing up. Made one stop on the way south to visit friends in San Diego: the world's oldest surviving McDonald's (eight years to the day older than I am), recently restored in Downey, California. The owner bought his franchise directly from the McDonald brothers before Ray Kroc got involved -- it wasn't even part of the McDonald's chain until the 1990s. Following an afternoon and evening of socializing in San Diego, I headed north toward the Bay Area. At the same time, my friend Jamie Jensen, author of Road Trip USA, was headed south from Sacramento via the eastern side of the Sierras. We met for lunch en route, swapping travel tales for an hour and a half. (Bad news for roadside fans: Lillian Redman, former owner of the Blue Swallow motel in Tucumcari, died recently.) He gave me a copy of the new second edition, which looks even better than the first: 150 pages longer, with better maps, and with a half-dozen of my photos among the numerous illustrations. Then continued socializing in and around the Bay Area until this morning, when it was time to turn east. I'm returning to Chicago by way of the Lincoln Highway, which connected New York and San Francisco in the days before even the U.S. Route system. Unfortunately it also predates the US 40/I-80 direct connection between San Francisco and Sacramento, instead passing through Oakland, the entire East Bay,and down all the way to Stockton before turning north. The day's unquestioned scenic highlight: thirty miles of the old road climbing the western slope of the Sierras, past ski areas and Donner Lake to the Donner Memorial State Park near Truckee. If you recall Day 1 of the travelogue, in 1846 the 90 or so members of the Donner Party met in front of the old Illinois State Capitol in Springfield to start their journey west to California via the Oregon and California Trails. They got a late start, lost more time to a horrendously misguided "short cut" which led them across the Great Salt Lake Desert, and reached the Sierras after the first snowfall. 22 feet of snow fell that winter, trapping the party in the mountains. About half of them died, and about half of the survivors kept themselves alive by eating the dead. A statue and museum mark the site of the ill-fated camp.